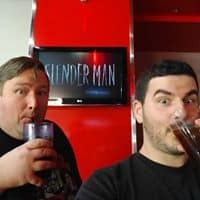 Horror Movie Talk was born on an eerily silent night in July of 2018. David Day and Bryce Hanson were snooping around an abandoned cemetery in Vancouver, WA. They interrupted their normal ritualistic incantations to discuss something that was lacking in their lives – true horror. They realized that while they sat around and watched horror movies, sipping on the blood of the innocent, others in the world were blissfully unaware of the frights available to them. Bryce and David realized that others didn’t have the head-start on horror that they did. Others need their horror categorized, assigned a quality score, and otherwise dissected to be palatable. This was something they could provide. Horror Movie Talk swam through the seeping birth canal of the interwebs and exploded into the night with a frightful howl! Completely covering its listeners with raunchy laughter and interesting tidbits of gore, Horror Movie Talk was unleashed on the world. Behold, the creators. Behold, the heartbeat behind Horror Movie Talk! When it comes to horror movies, we love them. We love the great ones; we love to hate the bad ones, we just enjoy everything about them. We give pretty much everything a fair shot and want our audience to be able to trust not only our taste but our integrity. If you would like a certain movie reviewed, drop us a line on Facebook or Twitter, and we will do our very best to find it, watch it, and review it. Remember, we publish a new podcast every Wednesday. Make sure to review us on iTunes and subscribe wherever you get your podcasts. If we aren’t available on your favorite podcast service, let us know! In all seriousness, if you enjoy writing and horror movies, please reach out to us at info@horrormovietalk.com. We would love to help you become a regular contributor to the site!